Can you see the difference? The vibrant wood grain should be the biggest difference you see, but we also nudged the color a little bit to make it more brown…less yellow/orange in color. 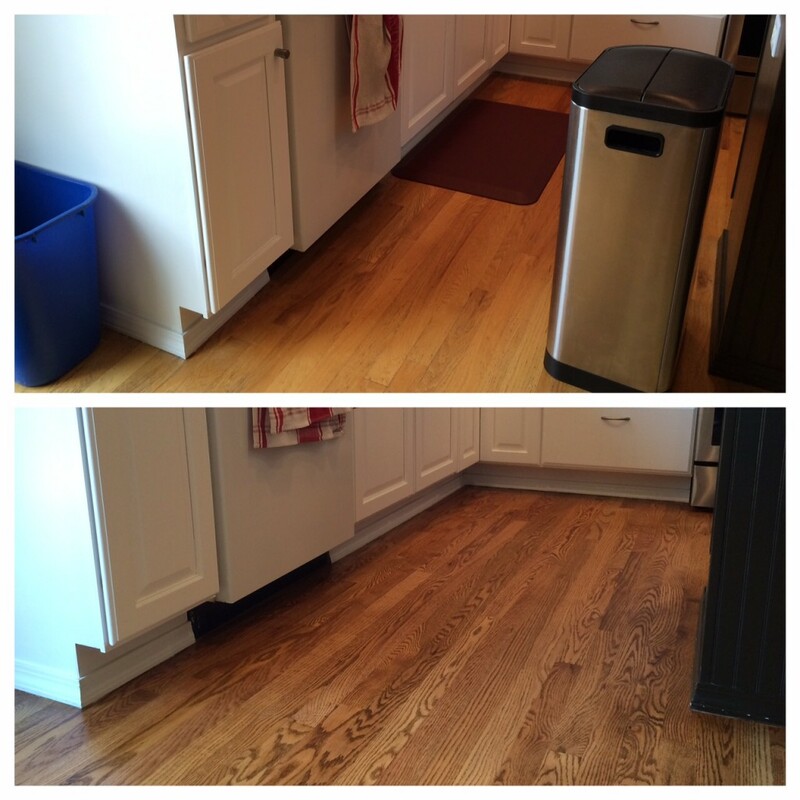 On Thursday and Friday, we had a contractor come in to sand and re-stain our hardwood floors. Jeff from “A Cut Above Hardwood Flooring” was recommended to us by our carpet cleaning guy. 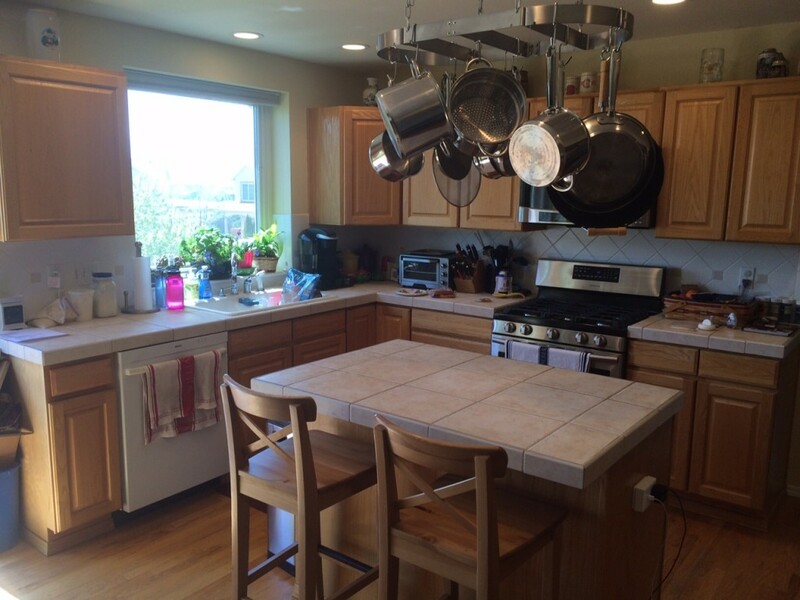 This piece of floor is continuous from the front door to the kitchen, and to access the front door, garage, basement, and staircase, you will step on the hardwood. I’ll discuss how we dealt with that in a minute. 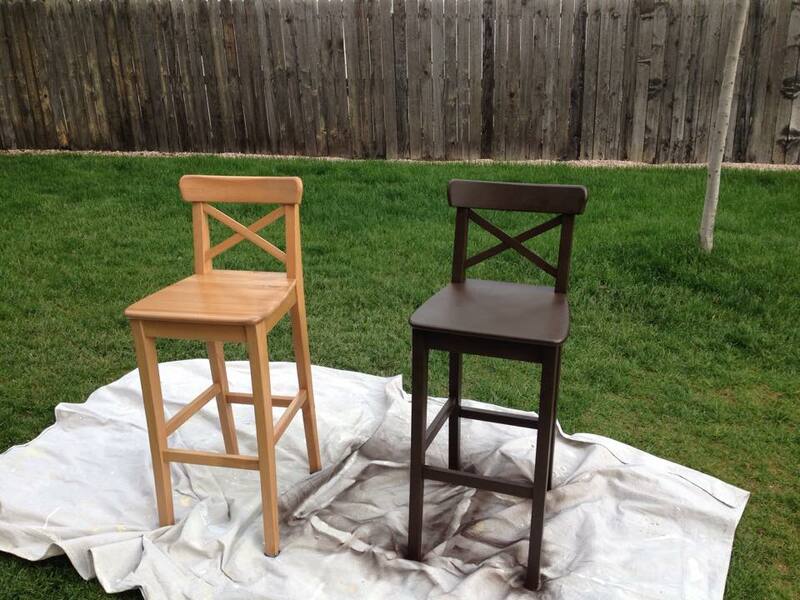 Today Dave painted our chairs. Before on the left, after on the right. I think they’re lovely! Our renovation continues, with just some little things. Unfortunately, our hardwood floor refinish was bumped from tomorrow to the end of this week, but that’s okay. We have a flexible week and it’ll work out. Note the bar chairs at the island. We are painting them so they don’t stand out from the new brown and white colors. No turning back now! This is after the primer only. The real paint goes on tomorrow. This weekend we are painting the cabinets. This is a much larger undertaking than the island we did last month. Instead of just the four doors we had to disassemble for the island, today we took down 28 doors! 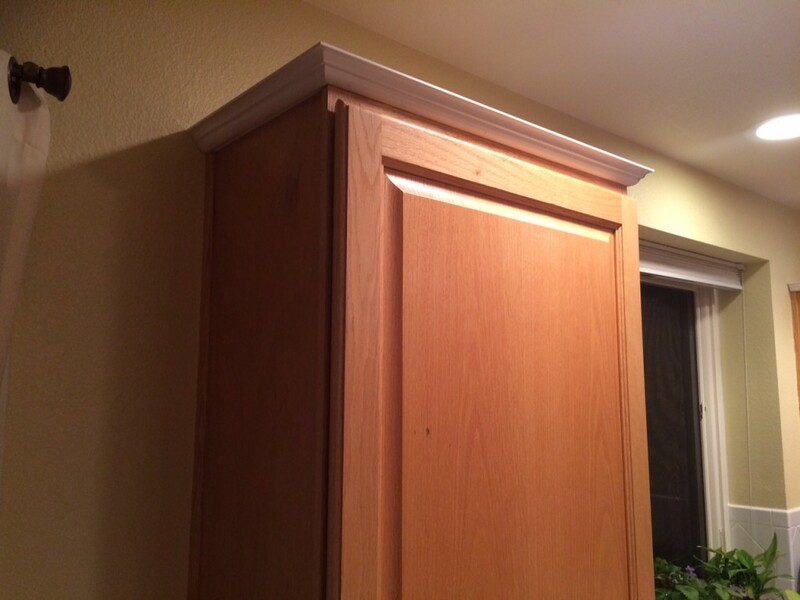 This past weekend Dave installed the crown moulding around the tops of our cabinets. This isn’t a super-tall design, we wanted something subtle, yet elegant. 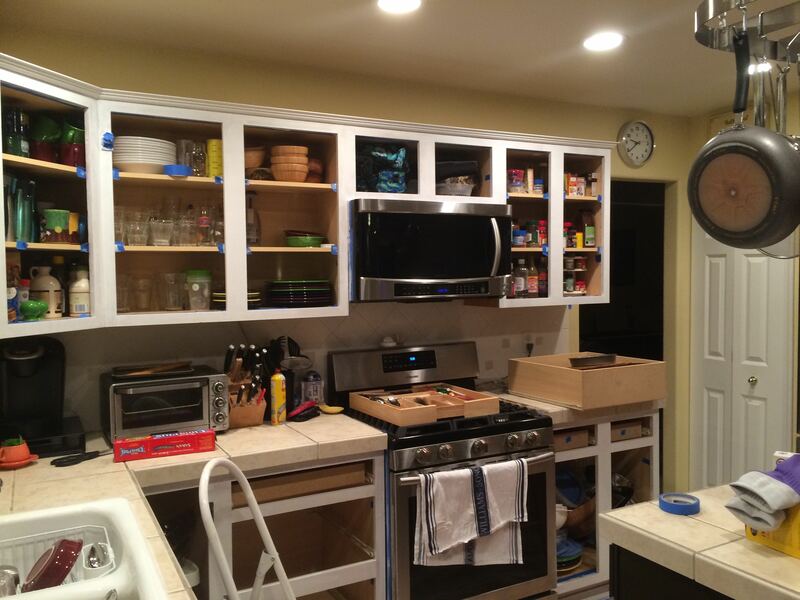 Later this week and this weekend we will start the priming and painting of the rest of the cabinets. We have a paint sprayer to use for the doors, but will hand-paint the cabinet bases. We also picked up our hardware for the cabinet doors and drawers. I can’t wait to see how awesome they look when installed. The moulding is white because we chose a PVC composite. What do you think? Left color or right? Bear with me while I try to figure out the iPhone version of my blog editor. 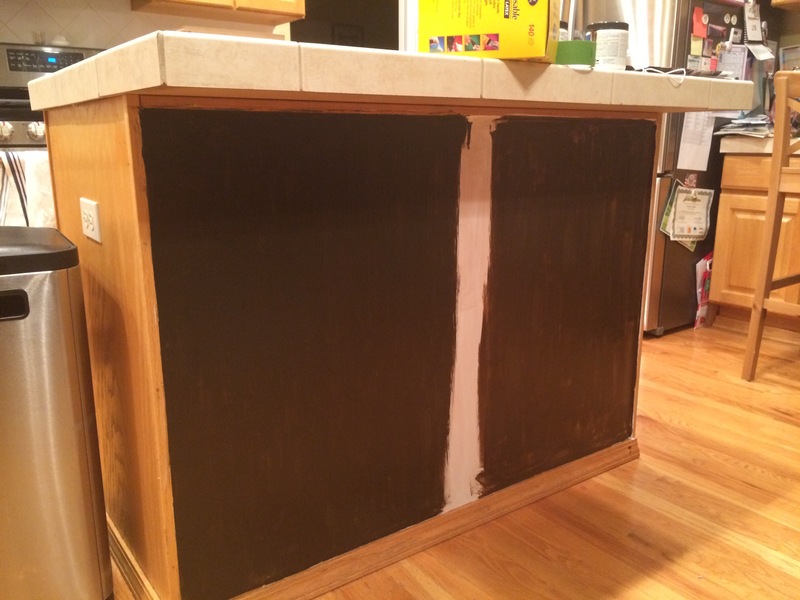 Tonight we tried out a couple “browns” for the kitchen island. This is a primer-less paint, and we are just covering this panel with beadboard so you aren’t seeing our “A game” in terms of paint prowess. We overwhelmingly agreed on the left-hand color. No, not pretty, but so tasty! I “won” this Keurig Elite from the HSC Charity Auction last fall. Like millions of other Americans, we have become Keurig customers. 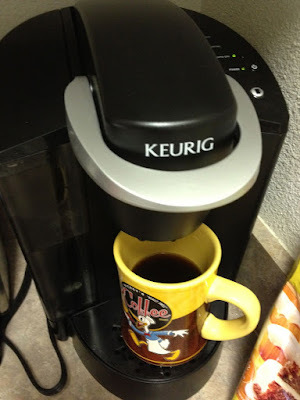 It’s like a revolution in coffee…Keurigs give you a “perfect” cup of coffee with very little work. The American dream, right? We got our first Keurig, a “Mini“, just before we moved from Nebraska to Florida in fall 2010. After the movers took our regular coffee pot, it was a nice way to keep having our coffee in the morning. It’s small and we didn’t have to keep coffee grounds on hand, just a box (or two) of K-Cups and some disposable coffee cups. That one ended up in Dave’s office. We like how it turns itself off after the cup of coffee brews. We get a bit paranoid about coffee pots being left on. This past fall we got one for the home. It’s been great. When you register your machine with Keurig, you get coupons for free K-Cups. BOGO for 2 boxes of 48 K-Cups. This was a great deal after Christmas when the Starbucks K-Cups became available online. K-Cup-brewed coffee is delicious and perfect every time. No doubt there. Checking Out a New Food Fad: McCormick’s "Recipe Inspirations"
Tonight I’m making chicken tikka masala for dinner. I never thought in a million years I’d be cooking homemade Indian food, but here I am! I don’t keep a ton of fancy spices on hand, they tend to expire before I use it all up. 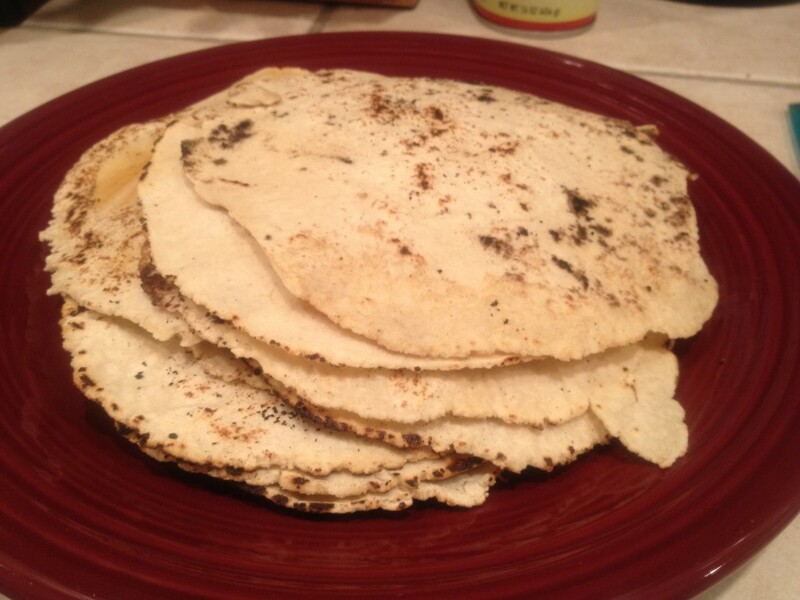 But for the past few months I’d been seeing these McCormick’s Recipe Inspirations at our local grocery stores and I got to thinking…. So here’s what we have…it’s a card filled with little bubbles of spices. Just enough for the recipe you’re making, pre-measured for your convenience. Flip the card over, and you have a listing of ingredients on the card, and the recipe. So while you’re on the same shopping trip you can pick up the rest of the ingredients you need. 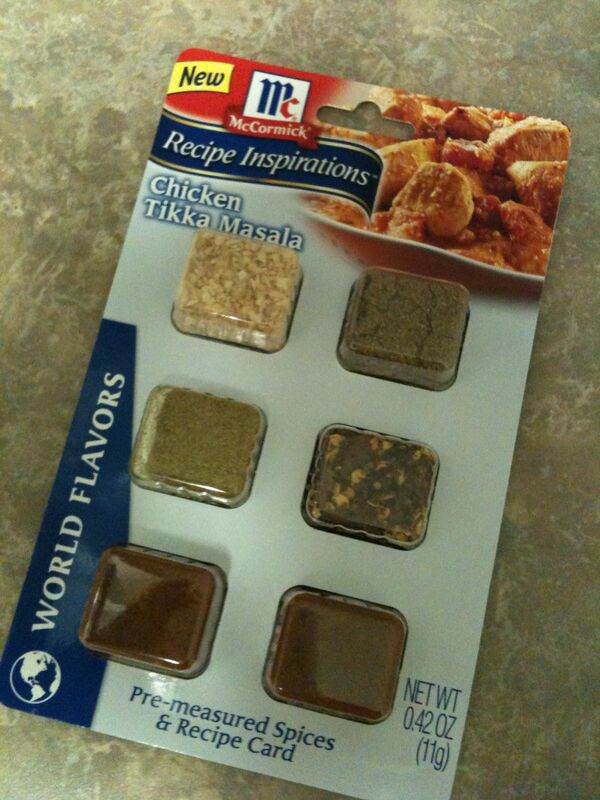 Here’s my assembly of ingredients ready to go. (Except for the salt and cornstarch, which I always have on hand). So when you peel the back of the card, I’m greeted with 6 individually wrapped packets of spice, marked with the type of spice and amount. I ordinarily would whine about the amount of packaging here, but there’s some utility to have the packaging this way just in case you choose not to use all the spices and you want to store it for later. I prepared the dish exactly as the recipe recommended. I didn’t include the red pepper (which was optional anyway), but instead gave that particular packet to Jacob. He loves red pepper flake! The verdict? This dish is very tasty, but didn’t seem like the tikka masala I’d had in restaurants. It was more like a chicken cacciatore with a hint of cumin. The kids liked it, but probably didn’t love it. I probably will be trying the Asian Sesame Salmon next time. **Please don’t think I’m being all elitist or anything about processed foods. I make meals like that once in a while. Lately with some of our family’s diet and stomach sensitivity issues, those easy-to-prepare meals are too high in sodium or other chemicals that make it tough to digest. Thankfully I saw replacements for this at Kohl’s this past weekend! This is a by-product of the frequent moves. 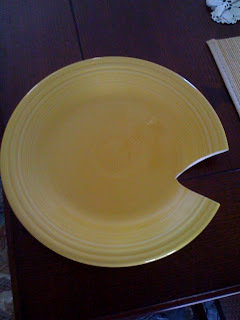 Things can break…and they do. Several of my kitchen tools have broken, and our scanner has a huge crack on the glass now. We’re probably about halfway unpacked at this point. The government has a process of letting us file a claim, and but it’s a lot of work. You have to go out and get replacement costs estimates, or repair costs if it’s an expensive item that has broken (such as an antique piece of furniture). We’ll see how much damage we end up with and decide which items are worth fightning for. The flatbed scanner, yes. A pizza dough roller, probably not.